Bloggers use social media networks and feeds to deliver the content directly to the readers. Feeds are the best way to keep the loyal readers stay up-to-date with the latest blog posts. To deliver the content through feeds you had two options earlier, short summary or full posts but now the blogger users can show the content in the feeds upto jump break. Blogger team now added the new option for its users show feeds until Jump Breaks in the posts. Up until now, you had two options “Short” and “Full”. Short option delivers the content with around first 400 characters of the post without HTML and images. Full option if selected delivers the feed that contains everything in the post including HTML and images. But now you can have the option to show first few lines of the posts with images. How to enable feeds until Jump Break? To enable this feature, simply sign in to your blog and go to Settings page. Now click on Site Feed option. 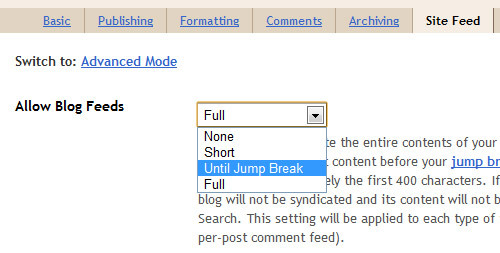 Under Allow Blog Feeds select “Until Jump Break” from the drop down menu. That’s it. Now from next time, whenever you use Jump Break in your posts, you feed readers will get the content only upto Jump Break that use used in the posts. If there are no Jump Breaks in the posts, the feed will show the full content. Thanks for the tutorial Definitely try on my blogger blog. Thanks for the Tutorial, this is really cool, i don’t use blogger, but i have won a domain name, thinking to host it on blogger. How to you insert a jump break into a classic custom template? i got it. it will show in new posts after setup. Thank you for this nice tips.